October in the North not only blankets the frozen ground with layers of serene white snow but it also transports action, challenge and incredible adventure that cannot be experienced anywhere else on Earth. Until interviewing Ryan Alford of Snowshoe Magazine, I was not aware of competitive snowshoeing and I never witnessed the potential relationship of a massive Buck and a bird until Ryan’s friend, Eli Frick, captured it in the photo below. How and where were you introduced to the snowshoeing? About seven to eight years ago, I was looking for a winter sport that would allow me to be active and be friendly to my wallet. I attended a winter sports trade show in Denver and was introduced to snowshoeing. I immediately fell in love with the sport. At the time, I was very unhealthy. I still carried my college “pizza and beer” weight. Snowshoeing allowed me to get outside during the winter months in Colorado. It allowed me to be healthy and lose a considerable amount of weight. Later, I decided to start an online magazine to represent the sport: Snowshoe Magazine at www.snowshoemag.com. What has been your favourite snowshoeing destination? For the 2008 Christmas holiday, I traveled to the Jackson Hole, Wyo. area. My family and I were invited to stay at Turpin Meadow Ranch – northeast of Jackson. This place is amazing. I was able to snowshoe along the Buffalo Fork of the Snake River. The snow was deep and perfect for snowshoeing. It snowed the entire time we were there. Plus, the surroundings were beautiful: The Ranch is nestled in Teton National Park and very close to Yellowstone. Although I’ve been to some amazing snowshoe areas, I think Turpin Meadow Ranch is my favorite so far. I also enjoy snowshoeing in Glenwood Springs, Colo. Glenwood is surrounded by some wonderful snowshoeing destinations. Please share an outdoor story related to one of the above areas. This past February, I attended a winter race called “24 Hours of Sunlight.” This race invited snowshoers, telemark skiers, backcountry snowboarders, and others to compete in a 24-hour race at Sunlight Ski Resort near Glenwood. The competition was killer! In fact, I was there to support Eileen Wysocki. She was trying for a world record for the most elevation gain in a 24-hour time frame by a snowshoer. She did a great job and set the record: 25,534 feet in 24 hours. Among all the snowshoe racers I know, Eileen is definitely among the top in the world. I was impressed by her determination and strength. I’m glad I had the opportunity to see her accomplishment. Have you ever experienced a wilderness medical emergency or been lost in the wilderness? If so please describe this adventure and any lessons learned. I’ve never been in an emergency situation, but I have experienced the sense of being lost. This happened at a WinterTrails event in Estes Park, Colo. I put on my snowshoes and started hiking through the Rocky Mountain National Park. I was totally engrossed in my surroundings and just kept snowshoeing. After a while, I realized I had snowshoed a great distance from the event. It’s pretty easy to get disoriented when snowshoeing. Luckily, I had a GPS device with me and I used its compass to get back to my car. Once I started to see other snowshoers, I knew I was getting close. Although, some of my friends were wondering where I went. This is an important lesson: Never go snowshoeing alone. Can you share any unique encounters with wild animals? A few years ago, I was snowshoeing with my good friend, Eli Frick. We were shoeing near Vail Pass, just off the I-70 highway in Colorado. As we were hiking back to our vehicles at end the day, we looked back at the ridge we just snowshoed over. In the distance, we saw a deer. No big deal. 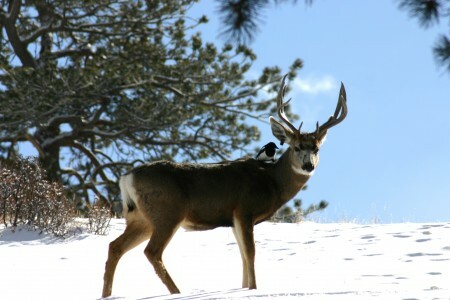 What we noticed was a bird perched on the back of the deer. Eli caught a picture of the moment. We watched the deer walk off with the bird still sitting on its back. A serene moment captured by Ryan Alford and Eli Frick. The buck looks happy to have a bird take a break on his back. If not previously mentioned, have you ever completed a thru-hike or multi-day backpacking trip and what nuggets of wisdom did you glean from it? Most of my snowshoeing hikes have been one-day adventures. Although, I would love to snowshoe the “hut system” near Vail, Colo. This is the ultimate backcountry experience. I also would love to snowshoe the Catamount Trail in Vermont. I think that’s my dream snowshoeing adventure. I’ll do that one of these days. What is your favourite outdoor website? I really like www.wintertrails.org. They have done some great things for the snowshoeing industry. If you’re a first-time snowshoer, this is the place to visit on the Web. What is your favourite outdoor hiking gear store? I really like the REI Flagship store in downtown Denver. It’s an amazing place. They restored the 1901 Denver Tramway Building. Very cool place. Visit www.snowshoemag.com. Subscribe to the free e-mail newsletter.